A life-threatening fungal illness is rapidly spreading throughout central California, health officials say. The number of Valley Fever cases rose eight percent in 2018 from the previous year - up to more than 8,100 from more than 7,500, according to a report released by the California Department of Public Health last week. The increase from 2016, when cases totaled around 5,700, was even more shocking - an sharp spike of 42 percent. Kern County, which is about 133 miles from Los Angeles, was hit the hardest by far, documenting a little more than 3.000 cases - up 23 percent from 2017 and 48 percent from 2016. Nine deaths were recorded in the county in 2017, which is the highest number in more than a decade, reported SFGATE. Counties that also saw a high number of cases include Los Angeles (1,036), Fresno (632), Tulare (425), and San Luis Obispo (353). Health officials suspect a few reasons for the rise in cases including rainfall affecting the way the fungus grows and spreads, more people moving to high-risk areas, and an increased level of detecting and diagnosing the illness. 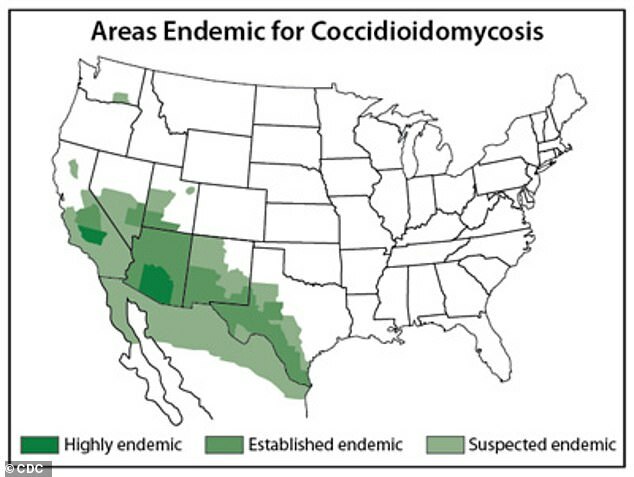 Valley Fever, also known as coccidioidomycosis, is an infection caused by a fungus found in soil. The fungus, called Coccidioides, flourishes in areas that are hot and dry, making California's climate the perfect area for outbreaks. Valley Fever is contracted by breathing in spores in the air and cannot be spread from person to person. Symptoms appear one to three weeks later and include a rash, fatigue, headache, fever, shortness of breath, coughing and muscle or joint pain. Because the symptoms resemble other illnesses, getting a correct diagnosis can be delayed. The illness generally goes away on its own after a few weeks or months without treatment, but some people may be given anti-fungal medication to reduce symptom severity. In a few cases, the infection can spread from the lungs to the brain, bones, skin or eyes, causing blindness, skin abscesses, lung failure and occasionally death. Approximately 10,000 cases are reported in the US annually, mainly in Arizona and California, according to the Centers for Disease Control and Prevention. Last week, a US appeals court threw out a lawsuit from California prison inmates and ruled that the inmates cannot hold state officials liable for contracting Valley Fever. Ian Wallach, an attorney for some of the inmates, said the ruling was devastating. 'The families of over 40 inmates who died and 100 who got infected and require lifetime medical care are left to fend for themselves,' he told The Associated Press.